Whey protein powder has been a staple supplement for health and fines buffs for decades. Protein supplements are seen as a quick and easy way to boost your protein intake. Amino acids, the building blocks of protein, are the essential ingredient used by our bodies to build new structures like muscle fibers. Strength trainers consider adequate protein intake to be the key to a quick recovery and muscle growth. Whey protein powder is derived from whey, the liquid material created as a by-product of cheese production. Some research has found whey to be a nutritious and beneficial food. On the other hand, many health experts take issue with the processes and additives used to form whey protein powders. You should consider the befits and risk associated with whey protein powders before you start regularly consuming them. Whey can help you lose fat and preserve your muscle mass. For most gym-goers, the ultimate goal is to lose body fat while keeping or even increasing their muscle mass. A study publish in Nutrition and Metabolism found that dieters who took a daily whey and amino acid supplement lost 6.1% body fat and persevered their lean mass better than dieters who were given a placebo to drink. Whey protein can be an appetite depressant. According the the mayo clinic there is good scientific evidence to suggest that whey protein powder increases feelings of fullness and reduces a person’s total food intake. Consuming whey may protect you against colon cancer. An article published in Preventative Medicine found that whey protein concentrate was very protective against colon cancer relative to red meat and other protein sources. Whey protein can cause gas and bloating. Manufactures generally strive to make their whey supplements lactose free because many adults are lactose intolerant to a certain degree. Unfortunately traces of lactose do tend to make their way into many whey powders. The presence of even a small amount of lactose can trigger excessive activity in your gut. Some whey protein powders have been found to contain heavy metal contaminants. It is important to understand that whey protein powder, like all other nutritional supplements, is not regulated by the FDA. In 2010 Consumer Reports found low to moderate range levels of arsenic, cadmium, lead, and mercury in some of the name brand whey protein powders they tested. This is especially concerning because many consumers use their whey supplement 1-3 times a day. This kind of exposure could have long term health effects. 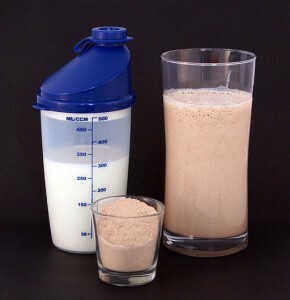 Whey protein may contain dairy related contaminants. Whey is made from milk therefore it is possible that some of the contamination concerns associated with milk could be a problem for whey supplements. The primary concerns for consumer would be the presence of antibiotics and hormones which are sometimes given to industrialized dairy cows. You don’t need a protein supplement. How much protein you need will be determined by your size and activity level. Most people can get adequate amounts of protein from whole food sources like, eggs, meat, fish, and beans. There are some clear benefits to consuming whey protein. The question you should be asking yourself is if the benefits outweigh possible negative side effects and if their is even a real need for you to supplement your protein intake in the first place.